UNITED NATIONS, Sep 9 2017 (IPS) - A dramatic increase in the number of refugees fleeing Myanmar is placing a huge strain on already very limited resources in Bangladesh, the UN refugee agency (UNHCR) said. In the last two weeks alone, an estimated 270,000 Rohingya refugees had sought safety in Bangladesh amid escalating violence in Myanmar’s Rakhine State. “The situation is very grave,” said UNCHR Bangladesh’s spokesperson Joseph Tripura to IPS. “There are people everywhere and refugees are scattered…[the camps] are at a point of saturation,” he continued. Two refugee camps in Cox’s Bazar in south-east Bangladesh has seen its population more than double, from nearly 34,000 to over 70,000 Rohingya refugees. “These are people that have been walking for days, many of them are tired and hungry and many are traumatized,” Tripura said. Though many arrive on foot, refugees are now seeking alternative and risky routes including a five-hour boat ride across the Bay of Bengal. One family of seven, one of whom was born just nine days ago, told UNHCR that they walked three days through the jungle to Myanmar’s border before taking a fishing boat to neighboring Bangladesh. At least 300 boats carrying refugees arrived at Cox’s Bazar on Wednesday, the International Organization for Migration reported. “There are many more waiting for boats,” another family told UNHCR. Though both families reached Bangladesh’s shores safely, others are not so lucky. A boat carrying at least five children sank on Wednesday and Bangladeshi border guards have reportedly pulled out the bodies of up to 40 Rohingya Muslims last week. Humanitarian agencies have also reported that many refugees are arriving with serious medical needs including some that have been injured by gunshots and bomb blasts. Myanmar’s military has repeatedly denied targeting Rohingya Muslims. With refugee camps already “bursting at the seams”, many new arrivals have no shelter, food or water and limited access to health services. UNHCR said that refugees are now squatting in makeshift shelters along the road and on available land in the border areas of Ukhiya and Teknaf. 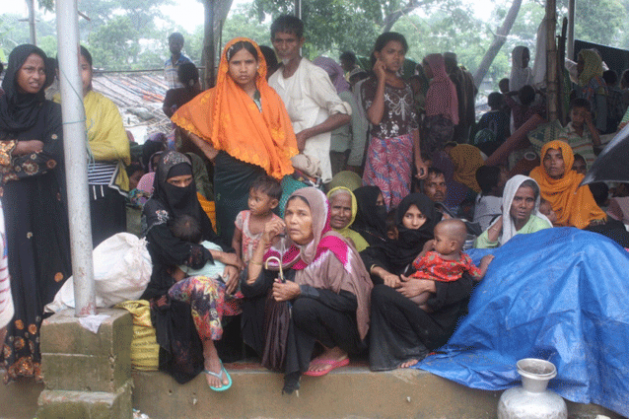 The agency estimated that up to 300,000 Rohingya Muslims may cross the border into Bangladesh. Tripura told IPS that there is an urgent need for more life-saving resources including more land and shelters. “We are not able to reach everyone and it is growing faster,” he said. The agency also called for swift action to end the conflict in Myanmar. “[The Government of Myanmar] needs to understand the underlying root causes of this problem and they should create a conducive environment so these refugees can feel safe to go back—it is a political decision that needs to be made as early as possible,” Tripura said. “We have been dealing with this situation for a long time, but we are not seeing any improvement…it is getting worse,” he concluded. The Rohingya Muslim community has faced a long history of repression in Myanmar where their status as citizens is disputed and their movement and access to social services is restricted, rendering the majority of the group stateless and impoverished. Prior to the most recent exodus, Bangladesh had already been hosting an estimated 500,000 Rohingya Muslims for over three decades. The influx began after Myanmar’s military launched “clearance operations” following attacks on security posts on Aug. 25 by an armed group known as the Arakan Rohingya Salvation Army (ARSA). Many have appealed to Nobel Peace Prize laureate and Myanmar’s State Counsellor Aung San Suu Kyi including the Nobel Laureate Desmond Tutu who fought apartheid in his home country of South Africa. “For years I had a photograph of you on my desk to remind me of the injustice and sacrifice you endured out of your love and commitment for Myanmar’s people,” Tutu wrote in a letter.